YOU CANNOT SAVE AND RETURN TO THIS PAGE. Make sure you have all of your projects complete before completing this form. Once you have completed this form, and your counselor can review your results, they will sign your blue card and the RMSC will mail it to you at the address you provide on this form. If you do not receive the completed blue card within 14 business days of completing the form, please call Joelle Adolfi at 271-4552 ext. 347. 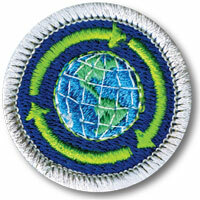 Thank you, and congratulations on completing your Sustainability Merit Badge requirements!